Subscribe/follow to receive daily issues by email and gain submitting privileges. Following on FaceBook alone does not give you submission privileges, for that you must follow this blog by email. Instructions and rules for subscribing/following and for making submissions are at the bottom of every issue. By making a submission you are indicating you have read and agree to follow the rules. Jukebox Bandits: Hi folks, Jukebox Bandits have one gig this weekend. Friday 29 June: Bar Cerezo, Canillas de Albaida, from 8.30pm. To reserve a table call 952 553 018 or 699 933026. Hope to see you there, booking highly recommended. Art classes: free – in Torre del Mar in the Azucarera building. Monday and Tuesday painting, Wednesday pottering, Thursday mosaic. Basic Spanish essential as teacher is Spanish. For more details contact Jose Luis 645500724. Car Boot/Market: Sunday 1st July. The regular “1st Sunday of the month” Car Boot sale/market is at El Pantano Restaurant car park, overlooking Lake Vinuela, on Sunday 1st July. 9.30am to 1.pm. Easy to find on the A356 towards Colmenar. Drive over the bridge crossing Lake Vinuela and the car park/bar is just ahead on the right hand side. Plenty of parking. There are always bargains galore……….. old and new. – Plants, shrubs, flowers and herbs. – Always a good selection of DIY tools. Computers- DoctorLaptop’s July Specials: The heat is upon us, and that is bad news for your computer. Keep yours running cool by scheduling your annual maintenance servicing now. If you rely on your computer and want it running at peak performance an annual professional servicing is necessary. You wouldn’t drive your car till it runs out of oil before servicing it, would you? I do the most comprehensive cleaning and tune-up possible: verify all System files replacing any found to be corrupt, test all hardware and do hard disk sector repairs if needed, use 5 tool malware/adware/spyware removal protocol, update Windows + all drivers + programs, install free ransomware protection, optimize your settings for fastest overall performance and clean your fan and cooling channel. Job usually completed overnight. Heavily infected comps or those showing error messages need a repair, not a maintenance service. Hard disks of 1000Gb or more add €10 and may require 2 days to complete. €50. Special deals and free shopper assistance! 1. 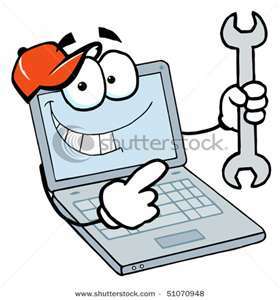 Bring in two computers for maintenance service and get 20% off, €80 for the pair. 2. Free shopper assistance, provide me your requirements and I will check all the local or UK stores for your best options. 3. Backups. Hard disks hate the heat. What would you lose if your hard disk crashed, irreplaceable documents, pics, vids or an extensive music collection? Do you have a backup copy of Windows should you need to replace your hard disk? My backup service makes a clone copy of your entire hard disk onto an external USB hard disk. This backup provides you with access to all your data, plus a copy of your full operating system exactly as it is at the time I do the job. Should your hard disk fail and require replacement, the backup can be re-cloned onto a new hard disk, no need to setup Windows all over again, no need to reinstall programs or drivers or files. I can supply a new 1000Gb external hard disk and do the clone backup for €100. Computers with a hard drive larger than 1000Gb add €40. *These specials end August 1st, 2018. DoctorLaptop, 675 993 069 (no calls before 11am please) or doctorlaptop@protonmail.com. Torrox Costa. Missed calls returned asap. If you misplace my contact info, it can be found at the bottom of every issue of DigameXtra. Repairs, Setups, Lessons, Websites, Data Recovery and more. Offered: Horse riding. Come and ride, and see the country side. One to One or Two to One. Early morning or late Afternoon. Contact on poster. Tina. Pamela, interpreter: To my clients, patients and friends. Operation over. Recuperation practically over. I hope to be back in business from Monday, 2nd, July. But do call me before, if you need my help. My phone is always on. And…. many thanks for all your support and kindness. Pamela. 609040709 Algarrobo. -Two matching stainless steel indoor/outdoor kitchen units with shelves and plumbing to the sink. Never used – perfect for an outdoor kitchen. depth 65cm width 136cm (sink unit) 65cms (square unit) height, 50 euros for the pair. Email: heatherandwill @ hotmail .com (no spaces) tel 628306371 Vinuela area. For Sale: Microwave. Cecotec microwave only used for 3 months not needed in new place. €30. no offers, contact paul whatsapp 629167861 competa. *Send in your text & photos- The address for your submissions is digamextra@protonmail.com The Deadline is 4pm. One pic per item or event, readers can email you for more. Three For Sale items per day max. Include all sale items/pics for that day in single email. For Sale items must include a price. *Keep Submissions As Short As Possible. *Bars, Bands, Restaurants Clubs & Charities – Please limit your entries to One per Week! *Health Professionals- Your submissions must include a Licence Number and name the issuing authority. Beginning July 1st only long term (11 month minimum) property rental listings will be accepted in the For Rent section.